The Saint Bernard originated in Switzerland. They probably are descendents of farm dogs of the Swiss Alps and a Mastiff-type dog called the Molosser, that the Romans brought with them when they invaded the Alps in the first century B.C. The Saint Bernard was created around 980 A.D. by St. Bernard de Menthon and the monks that worked at the Hospice, a refuge for travelers traveling through the dangerous Alpine pass between Switzerland and Italy. It wasn’t long before they discovered that the St. Bernard was an excellent tracking and rescue dog. They were credited for saving 2,000 travelers during the three centuries for which the Hospice kept records. 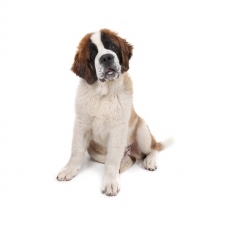 Today, Saint Bernards are in many homes, in the movies, and in dog shows. There are still Saint Bernards at the Saint Bernard Hospice in Switzerland; however, they no longer rescue travelers, but are living representatives of the Hospice’s history, and what a wonderful history is it! Saint Bernards are friendly, welcoming, steady, sweet and patient. However, training should be started early because they can be independent and stubborn and will learn bad habits as quickly as they will good ones, and you don’t want a giant dog running your house. They are, however, easy to housetrain. They are wonderful with children and are incredibly patient with them. Because Saint Bernards were originally bred to be search and rescue dogs, they need daily exercise and mental stimulation. They make good watchdogs and are very protective of their families. Saint Bernards are wonderful family pets who will want to sit at your feet, lie in your lap, and lean against your leg. They are so sweet, loyal and willing to please. Saint Bernards usually weigh between 110 to 180 pounds and stand approximately 25 to 27 inches tall. They are a large dog with a stocky and powerful build. Their coat can be either short or long, and the color is usually red and white. Between the years 1800 and 1810, a hospice dog named Barry was credited with saving 40 people and became one of the most famous dogs to ever live. Saint Bernards were often called Barryhundens in his honor.